Last November 3, 2009, selected student-scholars with a few teachers watched Michael Jackson's "This Is It" movie at Robinson's Movieworld, Bacolod City. 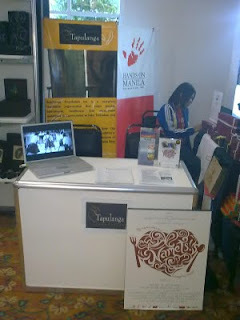 Thanks to the Tapulanga Foundation for this opportunity! Tapulanga Foundation funds for typhoon Ondoy went to the relatives of Sandra Garay, our office assistant at Bonfire Production. They were a total of five families. It’s been almost a month since the typhoon. They’re rebuilding their houses. But basically still had nothing. Amon was the representative who went with us when we bought their basic needs. Since he is a carpenter, he chose his tools, e.g. saws, a metric tape, hammers and other carpentry tools that he’ll share with his brother who’s also a carpenter. He looked pretty happy that he can do his job again using his own tools. I saw Amon holding a list as well so I asked if I could see it. Using a piece of torn paper and pencil he wrote: kawali, gas stove, plato, baso-tasa, kutsara, kaldero, sandok, dura box, tuwalya, damit, kumot, termos, kutson, kasirola, mangkok (bowl). Then he asked if they can have electric fans for the children. Plenty of mosquitoes there, he said. Even if they don’t have electricity yet, he’s hoping that it’ll get fixed soon. He chose plastic plates, cups and bowls. Aside from his list, we added rice and toiletries. Instead of buying mattresses which were expensive, Sandra suggested that they buy foam from a factory and make their own mattresses. They can sew the cover themselves. Instead of a plastic cabinet (dura box, according to his list), Tara suggested that they buy plywood and make their own cabinets. After all, he has tools now! He smiled when we said that. When we got to Provident Village, people were still cleaning and washing not only their homes but also the streets. There was still mud everywhere. There were MMDA bulldozers and pink-clad MMDA guys. The mud covered entire houses. And there was a dog on top of a roof, probably still traumatized. When we got off the van, we noticed a stench, a weird smell that’s like a mixture of dirty water and trash. It’s been almost a month but the smell is still there. Sandra showed us where she used to live. In the middle stood a little wooden house that Amon has been building since he and his family came back. It’s made of various types of wood and other stuff he could find. Inside the room is a wooden plank that serves as his family’s bed. On top of it was a mineral water container. That was it. It was bare. 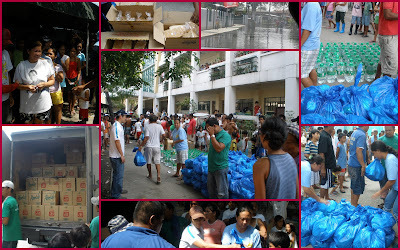 On the day typhoon Ondoy hit Metro Manila, these families thought it was just the usual flood. They’re used to knee- or waist-level flood that subsides after a couple of hours. But this time, it’s different. In a matter of hours, the water rose much higher than ever before. They didn’t want to leave their homes. But it became clear to them that they had no choice. Only the men know how to swim. But on that day, you had no choice but to sink or swim—literally. They couldn’t remember how they were able to go up the roof. But living in single-level, small, wooden houses, their roofs were too low for the flood. In panic, they held on to ropes and used styrofoam to stay afloat. Slowly—although they couldn’t remember how they did it—they reached the roof of their rich neighbor. There were about fifty of them on that roof. Just a few meters behind them was the dike and in the middle of the night, they heard a loud rumbling. The dike couldn’t hold the water. The water overflowed and destroyed the dike. They heard people calling for help. It was dark. They were wet and hungry. They didn’t know what would happen to them. That was their situation for two days. They took anything edible from what floated on the water. They even got some chocolates which they said must have come from their rich neighbors. They saw everything float--furniture, appliances and cars. And they saw floating bodies. They stayed on that roof till the flood was low enough. Old women and men were saved by a chopper while the rest of them walked. There was no transportation. There were trash and debris all over. 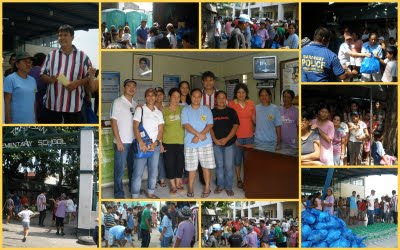 Sandra’s relatives walked from Marikina to Project 4. Eleven of them stayed at Sandra’s house for two weeks. When they came back to their houses, these were empty except for mud. Sandra’s old house, however, was no longer there. It got completely destroyed by the flood. No wall, no gate, nothing. What was left was one toilet bowl and some of their plants. Amon found his bike and small refrigerator among the debris. None of his or his family’s other belongings was found. 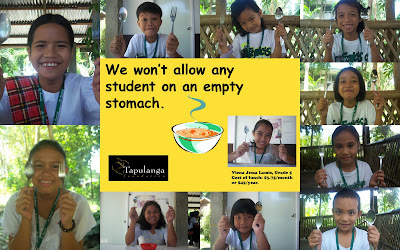 They’re all very grateful to Tapulanga Foundation for the big help. They’re starting their lives from nothing and it makes a difference to feel that there are people who reach out to them. 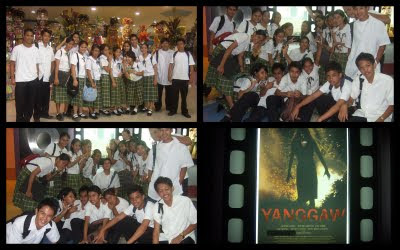 - by Fiona Borres - Partner, Bonfire Productions, Inc.
Yanggaw, an independent film of Cinema One, was watched by the fourth year class last October 21, 2009 with their adviser Mrs. Lina Gabino at Robinson, Bacolod City. 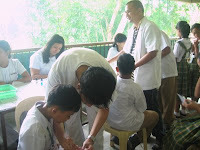 Thanks to the Tapulanga Foundation who sponsored this activity. Yanggaw (an Ilonggo word which means "infected") is a drama-mystery movie directed and wriiten by an Illonggo, Richard Somes. It is a story of an "ordinary family that has to deal with their extraordinarily dark secrets that will change their lives forever." Yanggaw won the most number of awards in the 4th Annual Cinema One Originals Digital Film Festival 2008 (Best Actor and Actress, Best Supporting Actor and Actress, Best Sound, Best Editing, and the Audience Award for Best Digital Movie). 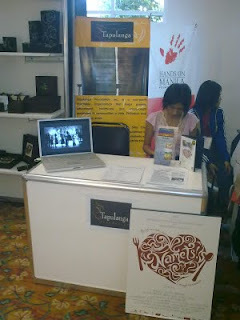 for SY 2009 - 2010! 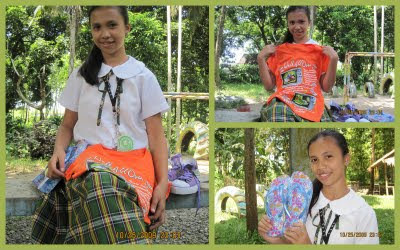 Syvil Ortega, a third year high school scholar, is one lucky girl. 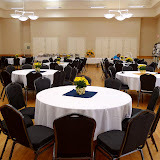 Her sponsor, Avis Frazier-Thomas of Los Angeles, California, always manages to remember her not only during the start of the school year but at various times as well. Syvil was so happy to get a pair of sneakers, sandals and a t-shirt from Ms. Avis recently. 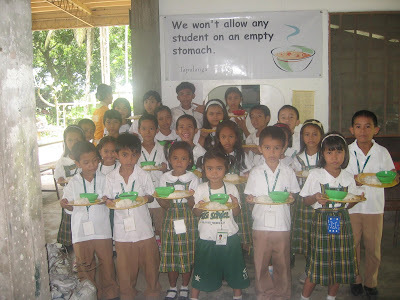 At the same time, Ms. Avis is amazed at how a small amount can go a long way in the Philippines. Ms. Avis has been supporting Syvil for several years. It is a relationship that goes beyond borders and they hope to meet each other someday. 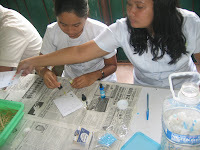 Janice Ragona, one of the Babes of Bacolod, visited St. Francis of Assisi School last October 15, 2009. She met with all 78 scholars of whom the Babes of Bacolod is supporting this school year. 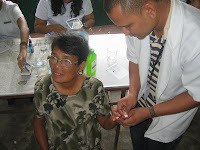 Last October 14, 2009, Janice Ragona of the Babes of Bacolod, together with her husband, Steve, and Tapulanga Foundation's Executive Director, Micmic Golez, donated medicines and supplies worth $4,000 to the Corazon Locsin Montelibano Regional Hospital. 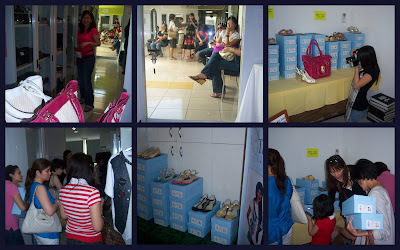 This is the 3rd year the Babes of Bacolod, with the help of the Tapulanga Foundation, has helped the hospital. 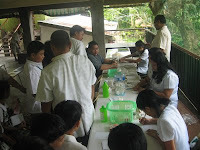 The medical supplies were accepted by Dr. Adonis Guancia, MD (Department of Internal Medicine chairman). One of the teachers of SFAS, Mrs. Josie C. Bactong, attended a workshop on Advance Campus Journalism for High School and Elementary Paper Editors last September 26-27, 2009 in Queen of Peace, Bacolod City. 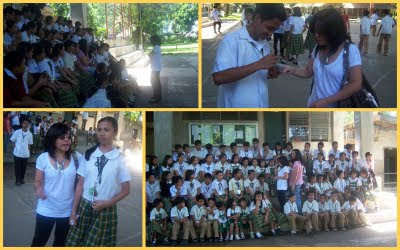 The Tapulanga Foundation sponsored Mrs. Bactong's fees and transportation expenses. The workshop was designed to equip participants with updated knowledge and skills needed in the preparation of school publications. Lecturers were Allen V. Del Carmen, M.S. in Journalism, Journalism Professor and USLS MassComm; Nannette Guadalquiver, M.A. in Journalism, Ateneo de Manila University Correspondent, Business World; Faculty, USLS MassComm and Nida Buenafe Sports Editor, DAILY STAR. 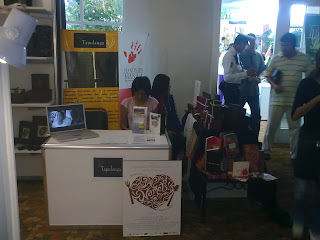 * Mrs. Bactong is currently one of the writers of the school and foundation blog. 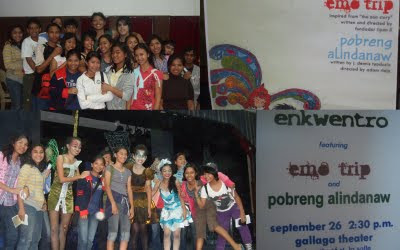 Thru the Tapulanga Foundation, selected students of SFAS watched a theater play entitled ENKWENTRO last September 26, 2009 at the Gallaga Theater, University of St. La Salle, Bacolod City. Two one-act plays were presented: “Emo Trip” and “Pobreng Alindanaw,” characters and storylines portraying the most difficult journey to launch - the journey towards oneself. 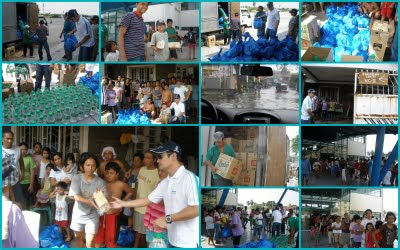 This week of tragedy from typhoon Ondoy has brought out hope as we saw people all over the Philippines and abroad joining together to help the victims. As early as last Saturday when the rest of the world didn't know about the flooding yet messages on Facebook were already being exchanged to mobilize help for the flood victims. Our former schools (La Salle, Ateneo, UP, etc.) and highschool groups (SearchIn) were sending out messages to staff, alumni and students to join and help in the efforts to bring food, water, clothing and medicines to the victims. Friends, cousins, workmates, nieces/nephews, former classmates, people halfway around the world are contributing what they can to help the victims through their churches, donating to the Philippine Red Cross/NGOs, sending money directly to their friends and family in the Philippines and organizing relief efforts on their own from cooking and delivering warm meals to donating their stock of bottled water. This tragedy has brought out the best examples of compassion we've seen in a long time, the human spirit of sincerely caring for our less fortunate brothers and sisters. Our work is not yet done as the recovery of lives will take some time, so please continue praying for the victims and their families and helping in whatever way you can.